Previous Auctions at Forsythes' Auctions, LLC. RUSSELLVILLE, OHIO — A rare E. Howard & Co. No. 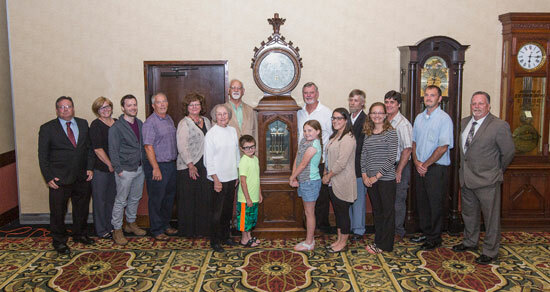 22 astronomical standing clock sold May 29 at Forsythes’ Auctions LLC when it hammered at $120,000, $138,000 with the buyer’s premium. Attracting much presale attention and bidders, the clock was hotly contested on the phones and went to a collector-dealer bidding by phone. The longcase Gothic-style clock in walnut retaining its original varnish finish has a 16-inch diameter reverse painted glass dial marked “E. Howard & Co. Makers Boston” with Arabic numerals. It was consigned by a gentleman who has attended, and bought at, auctions here over the years, said auctioneer Dave Forsythe. It was originally purchased privately from a jeweler in the early 1970s and made its debut on the market in this sale. Located at the Holiday Inn, 4501 Eastgate Blvd., Cincinnati, Ohio 45245. Exit 63A off I-275 to 32 to Eastgate Blvd. This auction includes the collections of the late Walter and Lynn Dingus, and the late Dave and Ann Early. Located at the Shelby County Fairgrounds on U.S. 60 West, in Shelbyville, KY. This auction includes items from estates and prominent homes. We will be conducting the International Nippon Collectors Club auction this year. We are seeking quality pieces of Nippon for this large event. The auction will be conducted live and there will also be internet bidding at www.liveauctioneers.com . Please contact us directly or send photos to info@forsythesauctions.com . Located at the Holiday Inn, 4501 Eastgate Blvd., Cincinnati, Ohio 45245. Exit 63A off I-275 to32 to Eastgate Blvd. Located at the Holiday Inn, 4501 Eastgate Blvd., Cincinnati, Ohio 45245. Exit 63A off I-275 to 32 to Eastgate Blvd. This auction includes the personal collection of the late Betty & Aaron Tumen, well-respected dealers and collectors & former owners of Brass Eagle Antiques. Located at the Shelby County Fairgrounds on U.S. 60, at the West end of Shelbyville. This will be a fine auction with a great selection of Americana! Visit Auction Zip for details. Located at 6264 South Lakeview Drive, Mason, Ohio 45040. From Snider Road, take Hunter’s Green Drive to left on Meadow Brook Drive to South Lakeview Drive. The estate of Betty Phillips Walker. All net proceeds will go to St. Jude’s Research Hospital. This auction includes the 50-year collection of the late Lynn Dingus, a well-respected show promoter, dealer and collector of fine Americana. Most of the items in this particular auction were “keepers,” and are from her personal collection. FRIDAY, OCTOBER 6 - 11:00 A.M.
SATURDAY, OCTOBER 7 - 10:00 A.M.
SUNDAY, OCTOBER 8 - 11:00 A.M.
SUNDAY, MAY 21, 2017 - 1:00 P.M. This will be a fine antiques auction with items from estates and homes including a fine antiques collection from a prominent attorney. SUNDAY, APRIL 2 - 11:00 A.M. This auction includes the 50 year collection of Ray and Carol Besl, which consists of a fine selection of Period American items. Featuring: Early American, Arts & Crafts, Pottery, Art Glass, Lamps, Silver & Jewelry. This auction includes quality antique items from estates and homes. SUNDAY, DECEMBER 4, 2016 - 1:00 P.M. Located at the Holiday Inn, 4501 Eastgate Blvd., Cincinnati, Ohio 45245. Exit 63A off I-275 to East 32 to Eastgate Blvd. This auction includes items from long time collectors and other fine homes. This auction includes a 40 year one owner collection of antique furniture, country store items and many collectibles. This auction includes a 50 year collection of Americana and original items from a country store that opened in the 1880’s. This auction includes antique items from the collection of Dr. and Mrs. Alan Luger. THURSDAY, OCTOBER 13, 2016 - 5:00 P.M. This auction includes over 400 lots of a wide assortment of Civil War and other military items including weapons; Many historical items including photographs, autographs, etc. ; Coins including American, Ancient & Medieval; a great collection of old circus posters, plus much more. NOTE: You may bid live in person, by absentee, by telephone or by internet at www.liveauctioneers.com. TERMS AND CONDITIONS: Cash, check, Visa & MasterCard with proper ID. 18% Buyers Premium. Russellville Fire Dept. three blocks away. Located at the Shelby County Fairgrounds on U.S. 60 at the west edge of Shelbyville. This auction includes the fine collection of Gloria Vaught, resident of Shelbyville for several years & the 50 year collection of Jack Knechtly. 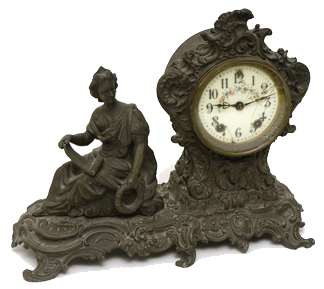 This auction includes items from estates and homes with a wide variety of fine antique items. 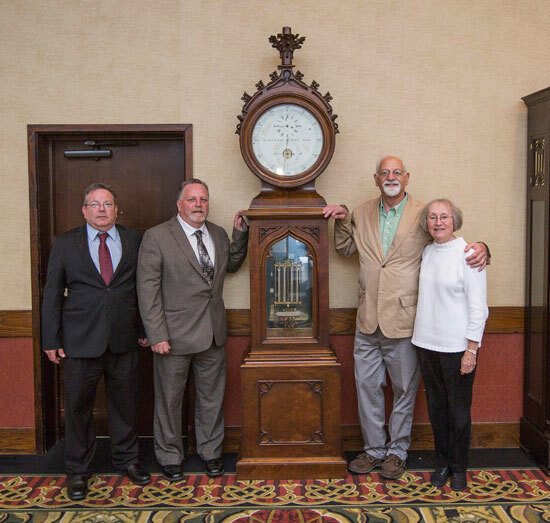 Forsythes’ Auctions is proud to present the 40 year collection of Dr. and Mrs. Alan Luger of quality antique items. We will begin the auction at 11:00 AM with over 40 un-cataloged clocks. Located at the Eastgate Holiday Inn at 4501 Eastgate Blvd. SUNDAY FEBRUARY 14 -11:00 A.M. This auction will include many items from a retired Pharmacist who collected Pharmacy items (and also purchased the contents of other old drug stores) & other great antiques for several years. It also contains several items deaccessioned from an Indiana Historical Society & also some great items from the estate of a long time Professor who collected fine items for many years. This auction includes items from fine estates and homes with many quality and rare antique items. Located at the Holiday Inn, 4501 Eastgate Blvd., Cincinnati, Ohio 45245. Exit 63B off I-275 to East 32 to Eastgate Blvd. This auction includes items from the Lynn Dingus collection and other homes and estates. FEATURING ITEMS FROM THE LIFETIME COLLECTION OF LYNN DINGUS. OVER 500 LOTS OF GREAT AMERICANA TO BE SOLD IN ONE DAY. NO INTERNET OR PHONE BIDDING. Located at the Green County Fairgrounds, 120 Fairground Road, Xenia, Ohio. SUNDAY NOVEMBER 15 - 11:00 A.M. This auction includes items from two large estates with a fine selection of early Americana!.SHELBYVILLE, KY.
Saturday’s auction includes the Roger R. Early estate and a professor’s estate who collected many fine things for several years. There will be 100’s of items, many selling in lots and many unadvertised items. A very brief description includes: several antique bisque dolls; several Hummels; fine glassware and china; silver plate items; several old Christmas ornaments; many collectibles; a few tools; boxes and boxes of items still unsearched. Sure to be many great surprises! This auction includes the estate of Robert F. Matthews, former Kentucky Attorney General from Shelbyville, Kentucky, and a large 30 year collection. SUNDAY, OCTOBER 25, 2015 – 1:00 P.M. Located at the Holiday Inn, 4501 Eastgate Boulevard, Cincinnati, Ohio 45245, Exit 63B off I275, East on 32 to Eastgate Boulevard. This will be a large two day antiques auction which includes items from the Caldwell family Kentucky farm, which was established during the Civil War. Located at the Holiday Inn at 3855 Hauck Rd., Sharonville, Ohio 45241. Take exit 46 off I-275, go North on Route 42 to quick left on Hauck Road. This auction includes items from the estate of Dr. John A. Powell, Georgetown, Ohio, Probate Court Case No. 20141184, and the late William J. Curry, Attorney of Chesapeake, Ohio. SUNDAY APRIL 26 - 11:00 A.M. THIS AUCTION INCLUDES ITEMS FROM TWO LARGE ESTATES WITH A NICE SECLECTION OF EARLY AMERICANA. This auction includes items from fine estates and homes including a prominent doctor’s estate and an avid art collector’s estate from Northern Kentucky. This auction includes the entire sports collection of Terry Thackery of Springboro, Ohio & also items from another long time collector. 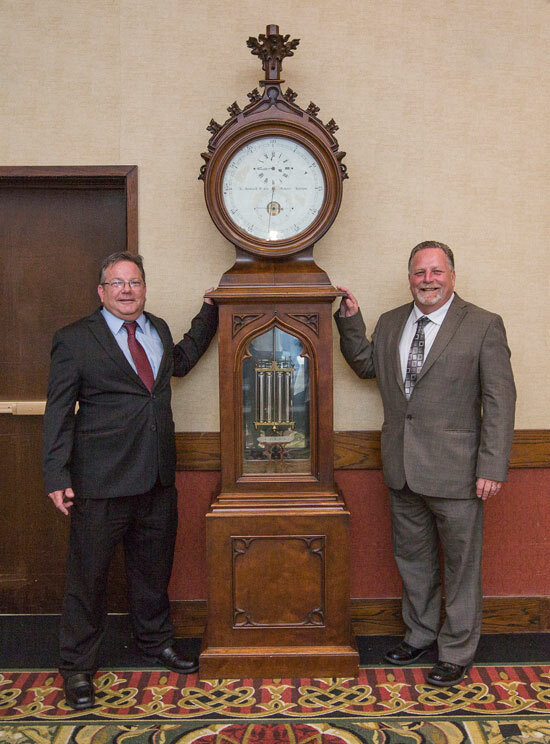 They both purchased most of the items at local estate auctions over the last 35 years. SUNDAY NOVEMBER 23 - 11:00 A.M. This auction includes items from two large estates with a fine selection of early Americana! Located at the Holiday Inn at 3855 Hauck Rd., Sharonville, Ohio 45241. Take exit 46 off I-275, go North on Route 42 to quick left on Hauck Road. This will be a well rounded auction with quality antiques from estates and collections. This will be a fine antiques auction with quality antiques from estates and homes. This auction includes items from a lifetime collection of earlyAmerican antiques, and other fine estates. SUNDAY, MAY 4, 2014, 1:00 P.M. Located at the Holiday Day Inn at 3855 Hauck Rd., Sharonville, Ohio, take exit 46 off I-275 go North on Route 42 to quick left on Hauck Rd. SUNDAY, APRIL 27, 2014, 11:00 A.M. THIS AUCTION INCLUDES ITEMS FROM THE ROGER R. EARLY ESTATE & A PROMINENT COLLECTOR'S ESTATE. SUNDAY, APRIL 13, 2014, 11:00 A.M.
SUNDAY, MARCH 30, 2014, 11:00 A.M.
NO INTERNET OR PHONE BIDDING!!!! FRIDAY, MARCH 21, 2014, 5:00 P.M.
PART II OF THE 50 YEAR COLLECTION OF THE LATE RICHARD VALLEE. SATURDAY, MARCH 22, 2014, 11:00 A.M. Featuring items from a prominent Cincinnati collector that has recently passed away. SUNDAY, JANUARY 5, 2014, 11:00 A.M. This auction includes items from a fine collection of early American antiques and other fine estates. SUNDAY, DECEMBER 1, 2013, 12:30 P.M. Located at the Holiday Inn at 3855 Hauck Rd., Sharonville, Ohio, take exit 46 off I-275 go North on Route 42 to quick left on Hauck Rd. SUNDAY, NOVEMBER 3, 2013, 12:30 P.M.
SUNDAY, OCTOBER 20, 2013, 12:30 P.M.
SEPTEMBER 15, 2013, 10:30 A.M. This auction includes items from a lifetime collection of early American antiques and other fine estates. Located at the Eastgate Holiday Inn 4501 Eastgate Blvd. 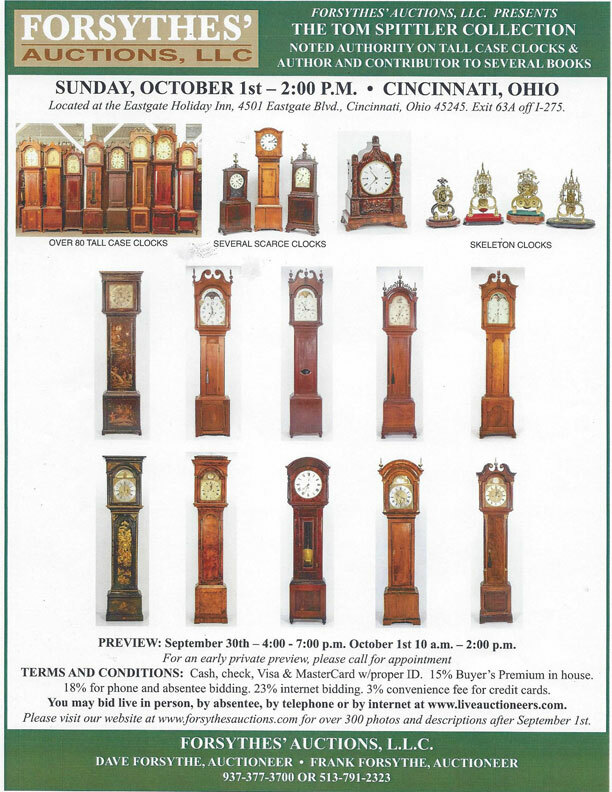 Featuring the 50 year collection of clocks & music boxes of the late Richard Vallee and music boxes & fine antiques from the estate of Frank Lienesch. Here is just a small preview of items to be sold. Full catalog will be coming in a few weeks. SATURDAY, MAY 18, 2013, 2:00 PM. Located at the Holiday Inn, 4501 Eastgate Blvd., Cincinnati, Ohio 45245, exit 63B off I-275 to East on 32 to Eastgate Blvd. This auction includes items from a Warren County, Ohio 50 year collection and other estates. APRIL 28, 2013, 10:30 A.M. This will be a fine antiques auction with items from estates. SATURDAY MARCH 23 - 10:00 A.M.
SUNDAY MARCH 24 - 11:00 A.M.
SUNDAY, FEBRUARY 24th -- 10:30 A.M. FEATURING A LARGE SELECTION OF COUNTRY AMERICANA, PRIMITIVES, VICTORIAN AND GENERAL ANTIQUES WHICH INCLUDES ITEMS FROM A LARGE ESTATE. SUNDAY, DECEMBER 30, 2012, 11:00 A.M.
SUNDAY, NOVEMBER 18, -- 10:30 A.M. FEATURING A LARGE SELECTION OF COUNTRY AMERICANA, PRIMITIVES AND GENERAL ANTIQUES WHICH INCLUDES ITEMS FROM A LARGE ESTATE AND A LONG TIME COLLECTOR. SUNDAY, OCTOBER 28, -- 10:30 A.M. This will be a large antiques auction with quality antiques from estates and homes. Located at the 4-H Hall on the Clermont County Fairgrounds at 1000 Locust St. off U.S. 50 on the West side of Owensville. This auction includes items from estates and homes including Batavia and Beechmont. MONDAY SEPT. 3 - 10:00 A.M. FEATURING A LARGE SELECTION OF COUNTRY AMERICANA, PRIMITIVES & GENERAL ANTIQUES WHICH INCLUDES ITEMS FROM LARGE ESTATE & ALSO ITEMS THAT HAVE BEEN HANDED DOWN FOR GENERATIONS WHOSE OWNER IS 99 YEARS YOUNG & HAS MOVED TO A RETIREMENT HOME. MONDAY MAY 28 – 11:00 A.M.
SUNDAY, MARCH 18 - 10:30 A.M.
SUNDAY FEBRUARY 26, 2012, 10:30 A.M.
SUN. JANUARY 8, 2012, 11:00 A.M.
SATURDAY, DECEMBER 3, 10:30 A.M.
SUNDAY, JANUARY 8th - 11:00 a.m.
SUNDAY OCTOBER 30, 10:30 A.M.
SUNDAY JUNE 19TH - 11:00 A.M. HISTORICAL AND POLITICAL ITEMS, AUTOGRAPHS, EARLY PHOTOGRAPHY, CIVIL WAR, BOOKS, LARGE COLLECTION OF MASSILLON AND STARK CONTY, OHIO ITEMS, COVERLETS AND MANY GENERAL ANTIQUES AND COLLECTIBLES. FRIDAY, JUNE 3 - 4, 10:00 A.M. SAT. MAY 28, 11:00 A.M.
WATCH OUR WEBSITE AS WE ADD OVER 400 PHOTOS AND DESCRIPTIONS. SUNDAY MARCH 20, 10:30 A.M.
SUNDAY FEBRUARY 6, 10:30 A.M.
November 14 - 11:00 a.m. Featuring Fine Art, Early American, Victorian, Clocks, Lamps, Fine Glass & many other collectibles. 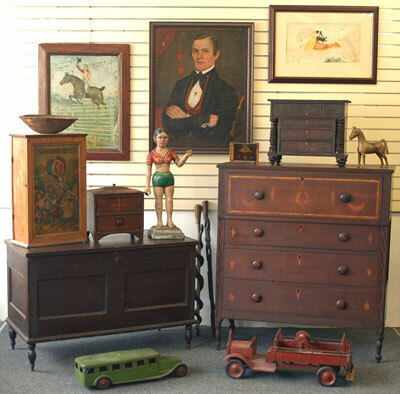 Featuring two large estates including large collection of Early American items, Victorian and many other collectibles. A 50 YEAR COLLECTION. THOUSANDS OF ANTIQUE & COLLECTIBLE ITEMS. MON. SEPT. 6, 9:30 A.M.
SUN. AUG. 8, 2010 - 11:00 A.M.
SUN. JAN. 24, 2010 - 11:00 A.M.
SUN. JAN. 3, 2010-- 10:30 A.M. This will be a large quality antique auction with items from estates. SUN. NOV. 22 – 10:30 A.M. FEATURING ITEMS FROM TWO LARGE ESTATES. SUN. NOV 1, 10:30 A.M. FEATURING THE LIFETIME COLLECTION OF THE LATE RAE & HI FRIEDMAN. SUNDAY, OCT. 18 – 10:30 A.M. Featuring the lifetime collection of Mary & Cyril Cook. SUNDAY, SEPT. 20 – 10:30 A.M.
WEDNESDAY, APRIL 8, 10:30 A.M. THURS., JAN. 22, 2:00 P.M.
SATURDAY, DECEMBER 6, 11:00 A.M.
SUNDAY, OCTOBER 19, 10:30 A.M.
THURSDAY, APRIL 24TH, 4:00 P.M. THE COLLECTION OF THE LATE HARRY SCHULTE OF WEST HARRISON, IN. SUNDAY, JANUARY 20, 10:30 A.M. Located at the Shelby County Fairgrounds on U.S. 60 at the west edge of Shelbyville, KY.
MAY 26, 2007 -- 10:00 A.M.
SUNDAY, MAY 20, 2007 , 11:00 A.M.
FRIDAY, MARCH 2nd - 5:00 P.M.
• FORSYTHES’ LARGE PUBLIC ANTIQUE AUCTION • SUNDAY, JANUARY 28, 11:00 A.M.
SATURDAY, DECEMBER 30 TH, 9:30 A.M.
SUNDAY, DECEMBER 10 TH, 11:00 A.M.